Minutes before becoming the 14th President of India, Ram Nath Kovind on Tuesday made his first tweet. Interestingly, his fresh Twitter account has already garnered over three millions followers within an hour. 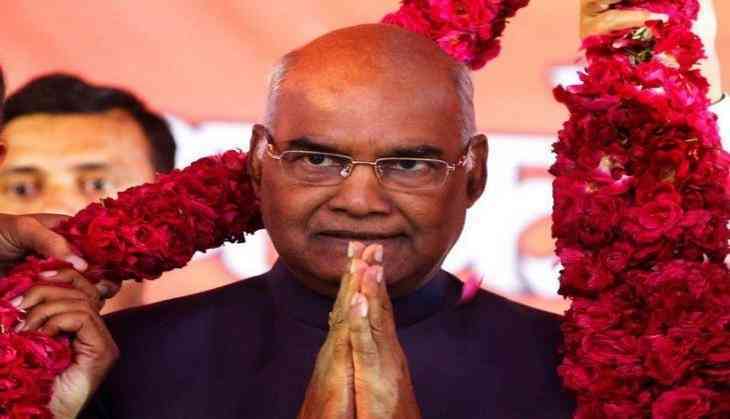 In his second tweet, President Kovind promised to stay true to all his duties and the people. "I bow to the 125 crore citizens of this great nation and promise to stay true to the trust they have bestowed on me #PresidentKovind"
At around 12:15 pm, President Kovind swore in as the 14th President of India in a glittering ceremony at the Central Hall of Parliament. He was administered the oath of office and secrecy by Chief Justice of India J S Khehar. President Kovind then addressed the gathering at Central as President of India, "I am accepting this position with all humility and I am grateful for this responsibility. I feel privileged to walk on the same path as Dr. Radhakrishnan, Dr. Abdul Kalam and Pranab da". Kovind arrived at the Rashtrapati Bhavan forecourt escorted by the Military Secretary to the President. Pranab Mukherjee had also taken Kovind on a tour of the official residence. In view of the ceremonial functions, the outgoing President Pranab Mukherjee along with Kovind proceeded to the Parliament in a six-horse carriage. Army, Navy and Air Force personnel flanked the Raisina Hill road. The dais at the central hall was shared by President and President-elect, Speaker, Vice President and Chief Justice of India. After the event, outgoing President Mukherjee proceeded to his new residence - 10, Rajaji Marg.